Italy and France represent old world wine done right to many folks. It seems like you can often blindly pick up a pretty expensive bottle and still think you’re drinking well. Here are a couple reviews of totally different wines at similar price points but both represent good QPR – or Quality Price Ration. Banfi Belnero 2010 Toscana – This is a wine with great body and full flavor for a price around $23. I did like it better the second night than the first. The time in the opened bottle – closed with a rubber stopper – seemed to do the body good. Coffee, cedar, and a nice dry mouth feel made this work well with some pasta and a grilled pork chop on back to back nights. This is a delightful three-grape blend dominated by Italy’s Sangiovese with hints of Cabernet and Merlot. The 2010 scored 88 points from Wine Spectator after garnering a 92 for the previous vintage. So it is a consistently good wine. The Banfi name is an iconic label known as the world’s oldest winery. The wines are very widely available. Banfi Belnero 2010 Toscana, SRP $25, Trade Sample, Highly Recommended. Domaine Lafond 2012 Tavel Rose’ – I’ve become a huge fan, as frequently noted, of Provence Rose’. But for years Tavel in the Rhone has been known for its fabulous Rose wines. The Tavel wines are richer in color – think a cranberry hue – and more full bodied than their lighter and salmon-pink wines to the south. This Rose’ is a traditional GSM wine but a Rose’ – Grenache, Syrah, and Mourvedre. It has the expected strawberry and a bit of berry candy flavor but delivers solidly for a different taste of French Rose’. Critic scores were all over the place on this wine but I’d rate it as solid wine you should try. Prices vary widely. Domaine Lafond 2012 Tavel, $19.99, Vine & Table, Carmel, Recommended. Time to finish catching up on wine reviews with a few more notes from the desk, bottles on the kitchen counter, and memories before they fade. All of these are value wines which aren’t that tough to find. So here we go! Clayhouse 2009 Cabernet Sauvignon – I’m always looking for a nice drinkable Cab under $20 and now I’ve found another! An under-$20 Cab isn’t going to have huge tannins and big fruit but I don’t want that at this price point – and/or it’s not going to be well made. Clayhouse Adobe is a great value line of wines from Clayhouse owned by Middleton Family Wines. I’ve had several of their wines but never the Cabernet. I opened their Malbec recently and was a bit underwhelmed considering how good their other wines have been. The Cab was a good bounce-back for one of my favorite value Paso Robles labels. This was rich and drinkable Cabernet. It had beautiful dark fruit, some herbal hints and enough acidity to balance the tannins enough for ribeye (which I consumed with it) but still smooth enough to sip with chocolate or some snacks. This does see a reasonable amount of oak, spending 12 months in American and French oak before bottling. The wine is 80 percent Cab with the remaining 20 percent Petit Verdot to give a fruit kick and color! Oh, it comes with a screw cap too! There are a handful of good Cabs at this price point in your neighborhood grocery or liquor store but few are better than this one for the price! Clayhouse 2008 Cabernet Sauvignon, SRP $15, Trade Sample, Highly Recommended for the price. Chateau de Segries 2011 Tavel – For years the Tavel region of the Rhone Valley has been known for the world’s best Rose wines. Provence, the southern Rhone, and the Languedoc now hold equal footing in some folks eyes but the Tavel Rose wines are well worth seeking out. The first thing you’ll notice is the deeper red color of Tavel Rose. For the most part, they are often in the hues of a cranberry or even deep red raspberry color. This wine was a blend of Grenache, Cinsault, and Syrah. This is a dry Rose with a bit more punch to the flavor than the delightfully more delicate Provence Rose with the salmon pink color. This wine has bright cherries, raspberries and very restrained acidity. The Segries Rose has been generally well regarded garnering 91 points from Robert Parker for the 2010 vintage. I love Rose and this was a nice change of pace. I sipped it alone and with some simple salad shrimp on a hot day. 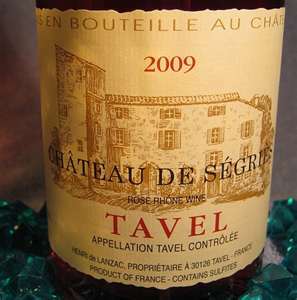 If nothing else, see out a Tavel Rose at your wine shop to compare to the other style Rose wines of France. Chateau de Segries 2011 Tavel, $14.99, Grape Vine Cottage, Zionsville, Recommended. Obra Prima 2007 Reserva Malbec – Malbec was the ‘next great thing’ for what seemed like the better part of a decade. If you read wine trade publications, that time has come and gone. But Malbec often delivers better wine for an affordable price point than other varieties. I liked this big red wine with a grilled steak a lot! The wine had big red fruit like black raspberry or blackberry and maybe even a hint of really dark chocolate. The acid and tannins were smooth and held up nicely to a New York strip I had prepared on the grill. This is not a wine for wimps, it’s big red for big red meat. It’s available in Indiana and perfect for that beef sizzling on the grill. This was one of better Malbecs I’ve tasted in a long time. 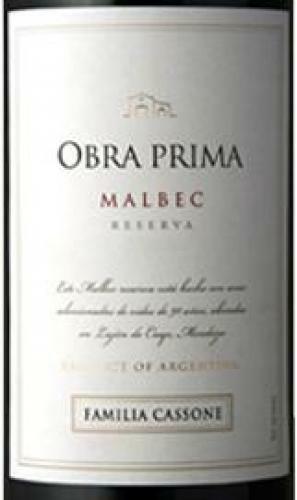 Obra Prima 2007 Reserva Malbec, $16.99, Grapevine Cottage, Zionsville, Highly Recommended. Sineann 2010 Red Table Wine – This was probably one of my top finds thus far this year. Sineann is a very well-known Oregon Pinot Noir producer. So when I saw the wine was a blend of Pinot Noir, Cabernet, Zinfandel, and “dashes” of Cab Franc and Melot …. let’s just say I was skeptical. You just don’t blend Oregon Pinot Noir with ANYthing! In most years the blend is approximately 50 percent Pinot. I was wrong with my preconceived notions. I didn’t want to like it because I’m one of those wine geeks that believe great Pinot doesn’t belong in any blend. But most wine drinkers will find this to be one of the most enjoyable and drinkable reds you’ll come across in 2012. This is clearly a ‘kitchen sink’ wine. They throw everything in it and it works remarkably well. It’s drinkable, sippable, quaffable, and more. If you find it buy it. Sineann 2010 Red Table Wine, $17.99, Cork & Cracker, Indianapolis, Highly Recommended.